Although there’s only slightly more good than there is bad to be found in all of CHIPS, audiences need to admire its dogged dedication to be an all-out buddy cop action comedy. Do its aspirations meet to genre’s pinnacle achieved with Lethal Weapon? Absolutely not, and it’s nowhere close. Yet I think you’ll be pleasantly surprised if you go into this one expecting something more along the lines of 2014’s Let’s Be Cops with a Bad Boys attitude. 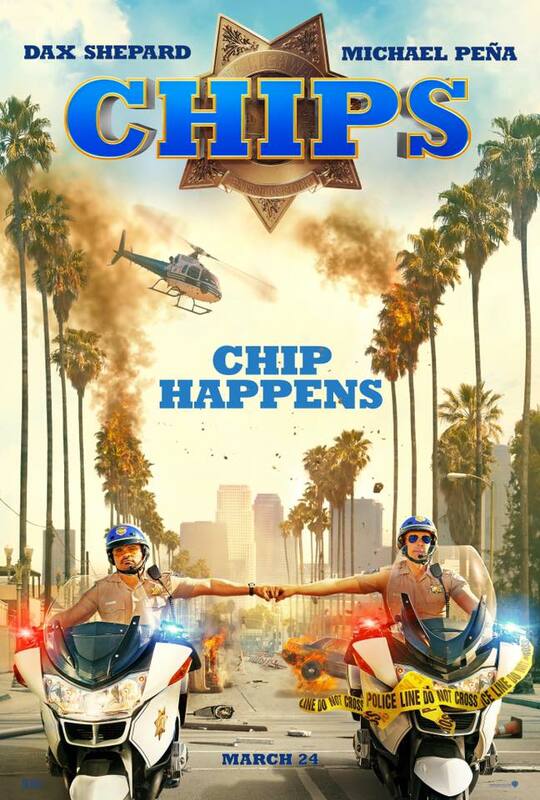 CHIPS is not a great film, but it provides the kind of innocent and R-rated diversionary laughter sorely missing from so many stale modern comedies, and that deserves a recommendation in my book. New to the California Highway Patrol is Jon Baker (Dax Shepard), the oldest rookie on record and a plucky guy living in a blind spot. His estranged wife (Kristen Bell) has an open affair in their home while Jon sleeps in the pool house, popping pain pills like antacids just to ease the aches from his litany of injuries as a professional motor cycle showman. Jon’s lost all of his sponsorships and joins the force as a last ditch attempt at saving his marriage, which is where he’s partnered up with Frank ‘Ponch’ Poncherello (Michael Peña). Ponch is an undercover FBI agent from Miami, there to investigate a sting of robberies committed by dirty cops. And when we see Lt. Vic Brown (Vincent D’Onofrio), it’s a bit too obvious that he’s the grizzly man behind the stings. All that’s missing is proof. Despite its strengths, CHIPS tends to fall flat in its antagonistic elements. The bad guy isn’t interesting, the ultimate showdown comes across as uninspired, and the chase sequences are nothing new whatsoever. This makes for a weak third act that’s weighed down by too much action, escalates too quickly, and admittedly becomes a bit tedious and expected. These are punches that we see coming and that we can easily dodge. There’s little to no impact from the ending. 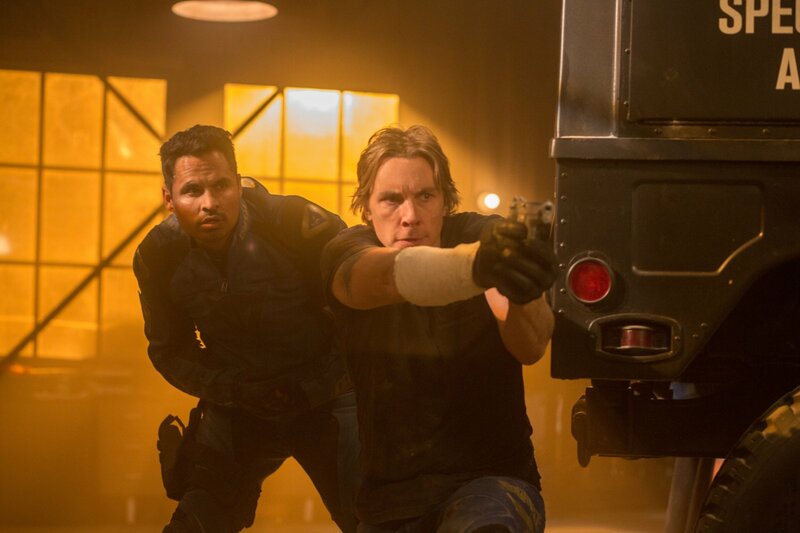 However, the rest of the film and its build-up actually has a few pleasant surprises, and the solid chemistry between Peña and Shepard elevates a movie where an inferior partnership would only escalate it into further pandemonium. CHIPS contains crass jokes, forgettable banter, and doesn’t shy away from bathroom humor, but it tells them all with innocence. Its heart is always in the right place even if its head rarely ever is. Some aspects reveal Shepard’s novice direction all too apparently; this is a film made by a performer and not by a director, and that shines through in the lax tone and pedestrian action sequences. It’s not that these parts are necessarily bad, just more so entirely bland and missing salt. These are the buffet courses of the film, and the flavor can be found in the connection between the two lead characters and their arranged brotherhood in personal issues and problems; we get to know these guys at a face value level even if we don’t get a Californian setting worthy of being as equally well-known. So much of American cinema has forgotten that you don’t have to be cruel or stupid to earn real laughs. This film might be mean but it’s also forgiving as well as dumb while still intelligent. And yeah, CHIPS could have been a hell of a lot better, but as far as harmless comedies go, you can certainly do a whole lot worse than this one. Kick back, have a laugh, and get on with your day.